FRYEBURG ACADEMY Find your place in the world. Mission Statement Fryeburg Academy is an independent secondary school that serves a widely diverse population of local day students and boarding students from across the nation and around the world. The Academy believes that a strong school community provides the best conditions for learning and growth. Therefore, we strive to create a supportive school environment that promotes respect, tolerance, and cooperation, and prepares students for responsible citizenship. Within this context, the Academy’s challenging and comprehensive academic program, enriched by a varied co-curriculum, provides the knowledge and skills necessary for success in higher education and the workplace. One Carnegie Credit is defined as two semesters of work. •	Students are required to earn four credits to qualify as a member of the sophomore class, nine credits for the junior class, and 15 credits for the senior class. 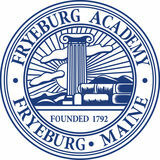 •	To qualify for a Fryeburg Academy diploma, students must complete four years of study with a minimum of 21 credits. •	Students must take four consecutive years of English. Fryeburg Academy regards four years of sequential high school study as educationally and developmentally appropriate. Therefore, the Academy does not grant requests for early graduation. REGISTRATION •	Students new to an MSAD 72 sending town must get FA registration approval from the MSAD 72 superintendent. •	A registration form must be completed and signed by a parent or legal guardian. •	Students cannot be registered without complete academic and medical records from their previous school. •	All students who do not reside in MSAD 72 must apply for admission through the Fryeburg Academy Office of Admission. 1. For students who enter into the Academy after the first semester of their freshman year, Fryeburg Academy will transfer in credit from accredited institutions These credits will count towards the students’ graduation requirements but will not be factored into GPA or class rank. The specific determination of which courses are awarded credit and how they count towards graduation requirements is determined by the Director of Studies. 2. Fryeburg Academy will accept students to a specific grade based on previous course work. If this course work is not done at an accredited U.S. institution, the Academy will most likely not transfer in the credit but may use it to accept a student to a higher grade. Students accepted to the 10th, 11th or 12th grade are subject to the three-year, two-year and one-year graduation requirements, respectively, as found in the curriculum bulletin. The Academy does not transfer in any credit from primary or middle schools. 3. For current students, Fryeburg Academy will transfer in credit from accredited or otherwise approved institutions with pre-approval from the Director of Studies. These credits may count toward graduation requirements but will not count toward GPA or class rank. The number and type of transfer credits which students will be awarded is determined by the Director of Studies. The Director may also limit the number of non-Fryeburg Academy credits that will count towards graduation. ACADEMIC PROGRAM SEMESTERS I AND II Our goal is to prepare each student for success in institutions of higher learning and the workplace. To help students identify and follow a pathway to postsecondary study, the Academy has identified standards which prepare students for higher education. School counselors and class deans work with parents, advisors, and teachers to aid students with their academic program. The Academy reserves the right of final student placement in individual classes. Research has shown that class size is one of the strongest determinants of educational quality, so we strive to create the smallest possible, evenly-sized classes. Therefore, we cannot honor requests for specific sections or teachers. MAY TERM During the three-week May Term, students take up to four courses. May Term courses are worth between 0.25 and 1.0 credits. Students must register for classes that together total 1.0 credit. Courses are offered in a variety of subjects and are listed in the May Term supplement. CHOOSING A CURRICULUM Fryeburg Academy offers three levels of study, each of which is designed to meet the demands of differing post-secondary placements. Students are placed in the appropriate ability level by subject, depending on their learning needs. Competitive College Curriculum •	The competitive college curriculum is comprised of honors, Advanced Placement (AP), and college level (CL) courses and is designed to meet the requirements of the most competitive colleges. •	Students may take more advanced courses depending on their prior preparation and achievement. •	Students should take four years of the same foreign language and as many honors and AP courses as possible and appropriate. •	This curriculum is considered “very demanding” or “most demanding” by competitive colleges. College Preparatory Curriculum •	The college preparatory curriculum is designed to meet the requirements of a wide range of colleges. •	Students must take four years of English, mathematics, and science, and three years of social studies including United States History. •	We also recommend that students take at least three years of a foreign language. •	This curriculum is considered “demanding” by four-year colleges. Vocational/Technical Curriculum •	The vocational/technical curriculum is designed to meet the requirements of two-year colleges or vocational/ technical schools. •	Students must take four years of English, should take four years of mathematics and several other required courses. •	Enrollment at Lake Region Vocational/Technical Center or in technical courses at the Academy are important options. •	From this curriculum, students can continue studying at a college such as Southern Maine Community College, attend a technical school, or seek job placement. SAMPLE FOUR-YEAR COURSES OF STUDY The following sample programs are provided as helpful illustrations only. Each student’s actual program should be individualized to meet interest and post-secondary goals. All students are required to carry at least six courses each semester. All students must take an English class each semester. COURSE SELECTION PROCEDURE FOR NEW STUDENTS Parents and students are encouraged to take an active role in the course selection process. Students and parents should consult with advisors, college counselors, teachers, or class deans whenever they have a question or concern. Incoming students from Molly Ockett Middle School (MOMS) •	Students begin the course selection process in the late Spring through a meeting with the Director of Studies or Freshman Class Dean. Students receive a copy of the curriculum bulletin and should begin discussions with teachers and parents regarding their courses of study for the following year. •	Once all courses are requested, the Freshman Dean, working with teachers, school counselors, students and parents, places students in the proper courses and creates the master schedule based on the needs and interests of students. •	Students receive a copy of their individualized schedules in early June. The schedule the student receives in June may not include teacher names, as teaching assignments are not finalized until the summer. •	Students from MOMS and their parents are encouraged to schedule individual meetings with the Freshman class dean in May, June, and July. •	It is important to remember that the Academy does not accommodate course changes based on the teacher or on friends’ schedules. Incoming commuting day, domestic boarding, and local day students not coming from MOMS •	Students should contact the Director of Studies to schedule an in-person or phone conference once they are officially enrolled at the Academy. Based on this conference, previous course work and sending school teacher recommendations, students will receive an individualized schedule. •	Upon arrival, all new students take a placement test to verify their course placements and to identify any individual learning differences. Incoming international students •	Upon arrival, international students take an English and a math placement test. •	Following testing, the ESOL faculty meets with international students individually to choose courses. •	Every international student will receive a class schedule during orientation and will start classes on the first day of school. •	The following is the recommended course of study for international students who wish to earn a Fryeburg Academy diploma: One credit is defined as two semesters of study. 1-Year Students: Must earn a minimum of five credits including : 1 English, 1 math, 1 science, 1 U.S. history, 1 elective 2-Year Students: Must earn a minimum of ten credits including : 2 English, 2 math, 2 science, 1 U.S. history, 3 electives 3-Year Students: Must earn a minimum of 14 credits including : 3 English, 3 math, 3 science, 1 U.S. history, 1 social studies, 3 electives 4-Year Students: Same as the general graduation requirements found on page 2. COURSE SELECTION PROCEDURE FOR RETURNING STUDENTS •	All students are required to carry at least six courses each semester. •	In March, students receive a copy of the curriculum bulletin and should begin discussions with their advisors, teachers, college counselor class dean, and parents regarding their course of study for the following year. •	Students will complete their course selection using Net Classroom with the help of their advisors and current teachers*. •	When all course requests have been submitted, the master schedule is created. •	Students receive a copy of their individualized schedules in June. Students should review this schedule with parents, advisors, and college counselors. The schedule the student receives in June may not include teacher names, as teaching assignments are not finalized until the summer. •	It is important to remember that the Academy does not accommodate course changes based on the teacher or on friends’ schedules. *Students and advisors are encouraged to consult the four-year plan that each student has developed with his or her school counselor. COURSE CHANGES •	Parental approval is required for core course changes. •	For the first two weeks of a semester, students may change most courses by consulting with their class dean and school counselor. •	After that date and until the first marking period ends, a student may drop or add a course by filling out a drop/ add slip which requires the signatures of all concerned. (After a period of a few weeks, it is not likely a student will be allowed to add a course because too much work will have already been missed). •	A course that is dropped during the first two months will not appear on the transcript. •	Later in the semester, the same drop/add procedure is followed, but a WP for Withdrawn Passing or a WF for Withdrawn Failing is registered on the transcript. GRADING •	Grades are posted on the first Monday of each month. These grades are progress reports. •	Grades are cumulative over the entire semester. •	The final semester grades are the only official grades recorded on transcripts and permanent records. •	During the May Term, the same grading scale is used, but there are no progress reports. May Term grades are recorded on the transcript and count toward GPA. •	Each marking period will include an Effort Grade. Effort Grades do not appear on transcripts. GRADE WEIGHTS Courses are weighted by level. Level 1 and Level 2 classes are given no extra weight. Honor Classes will be awarded .5 extra toward a student’s Grade Point Average (GPA). Advanced Placement (AP) and College Level (CL) classes will be awarded a full 1.0 extra toward GPA. Please refer to the grade weight chart, above. HONOR ROLLS AND CLASS RANK •	Honor rolls are calculated after each semester. To be considered for the honor roll and class rank, students must be carrying a minimum of six courses per semester. Exceptions may be made for seniors in special circumstances and for students carrying three or more AP courses. •	Honor rolls and class rank include weighted grades given to Honors and AP courses. •	Because individuals may be separated by hundredths of a point in GPA, class rank will be reported as a decile, not a specific number. Students will be informed annually (after completing three semesters) if they are in the top 10%, 20%, 30%, etc. of their class. •	In order to receive decile ranking, students must have attended the Academy for three or more semesters. •	A GPA of 3.0 is necessary for honors and 3.67 for high honors. A student who receives a ‘D’ or lower or an incomplete is ineligible for honors and high honors. •	Honor roll designations on the commencement program are determined for graduates after the first semester of their senior year. ACADEMIC REVIEW The purpose of the Academic Review process is to aid the student in improving his/her academic performance and to ensure that the student is progressing toward graduation. There are three levels of Academic Review. 1) Academic Warning - If a student continues to fail over a period of time, the class dean will inform the student of the consequences of failure and may request a conference which may include the parents, the student, the advisor, the school counselor, and any teachers who are essential to the process. At that conference, the student’s study plan will be reviewed, and additional specific steps to implement it will be organized. Supervision is the responsibility of the class dean and advisor, and specific mechanisms will be put in place at the conference. 2) Academic Probation - If matters do not improve, the student will be placed on Academic Probation. The class dean will contact the parents and a conference with the Director of Studies may be mandated. 3) Academic Expulsion - If, after all of these steps, the student is still not progressing toward graduation, a review board consisting of the advisor, the class dean, the Director of Studies, and at least one teacher, will be empaneled. That board may conclude that the student should be expelled or should engage in some other program where he/she will be more successful. The student may be expelled for academic reasons only if he or she has reached his or her seventeenth birthday. Students who are expelled for academic reasons will be encouraged to seek academic alternatives. This may include applying to the Pequawket Alternative School, pursuing Job Corps, attending the Adult Learning Center in Bridgton, or considering the GED. the walls of a traditional classroom. Enrolled students cover a range of academic and learning profiles; honors-level credit The schedule for the May Term is as follows: in biology is an available option. Field Biology will equip high-achieving students who later wish to take Advanced Time: (Monday - Friday) Placement sciences with the skills and knowledge to do so. SPECIAL PROGRAMS Outdoor Learning and Research Center Among American high schools, the OLRC is a program of uncommon scope and possibility, centering on experiential learning to cultivate inquiry, exploration, environmental stewardship, and leadership. Aiming to take best educational advantage of our region’s abundant natural resources, the OLRC provides place-based, hands-on programming for both the school and wider community. Field study, scientific research, and agriculture characterize the OLRC’s curricular offerings and utilize our on-campus learning center and adjoining fields, forest, and Saco River access-- a 63-acre outdoor classroom and laboratory. These offerings include OLRC Field Biology and OLRC Field Chemistry, described below. OLRC FIELD CHEMISTRY This honors-level course for highly-motivated tenth and eleventh grade students is a hands-on opportunity to learn chemistry in the context of local ecological systems. We will study energy and biological and chemical processes, with a significant emphasis on fieldwork, research, and outdoor expeditions. The Saco River Valley intervale, White Mountains, and other northern New England geographies are regular classroom and laboratory spaces as students pose and test scientific questions in the field, as well as regularly engage in hiking and orienteering activities. Completion of the course addresses one semester’s worth of Wellness requirements. This experience-based class will strengthen student skills in critical thinking, collaboration, problem-solving, scientific inquiry, presentation, and outdoor leadership. Students must be comfortable working independently and outside the walls of a traditional classroom. The course will culminate in a long-term research project and presentation and enrolled students cover a range of academic and learning profiles. Field Chemistry will equip high-achieving students who later wish to take Advanced Placement sciences with the skills and knowledge to do so. OTHER CONSIDERATIONS •	To be enrolled in OLRC Field Biology or Field Chemistry, a student must be taking Algebra I or higher. •	ESOL students are welcome to participate with the approval of the Director of the Center for International Students. For more information, contact Joel Rhymer at jrhymer@fryeburgacademy.org. The Center For International Students The Center for International Students (CIS) at Fryeburg Academy serves all international students, regardless of language ability. Our CIS includes English for Speakers of Other Languages (ESOL) courses, TOEFL prep courses, specialized college and financial aid assistance, and a senior English course to prepare international students for college-level reading and writing. Our faculty members also work with students on topics such as course selection and cultural issues. Entrepreneurship Studies All classes in this area during the school year and May Term are taught by entrepreneurs with over 20 years of experience in business and teaching. FRYEBURG ACADEMY ENTREPRENEURSHIP COURSE 0462/0463 (Evening Class) The entrepreneurship program focuses on the writing of a business plan from an entrepreneur’s point of view. The subjects covered are: vision, mission, values, the development of an entrepreneurial culture, marketing [domestic and international], sales development, operations and financial planning. In addition, we stress the importance of critical thinking, calculated risk taking, problem solving and supply and demand strategies for a business startup. We also place our discussions in the context of the current global economic situation. We take field trips to interesting small businesses and we have guest speakers who have various expertise in the subject matter of entrepreneurial development. Fryeburg Academy has a partnership with the University of Southern Maine School of Businesses Center for Entrepreneurship for this course. The program delivery is similar to college. We expect the students to be self-starters and motivated. The students may choose any business idea that interests them and develop a business plan for it. At the end of the spring semester they must present the plan to the Head of School, selected members of the faculty, and business community. separate internship period in their schedules. The following are requirements for internship placement. A student must 1. Be in and maintain good academic standing; have and maintain consistent record of good school citizenship. 2. Make a commitment of at least 120 min. weekly for a semester 3. Have parental permission (if under 18) 4. Maintain five classes at the Academy 5. Make a commitment to be professional, respectful, and a good representative of the Fryeburg Academy. 6. Offer a presentation to an audience of FA administrators, faculty, and area business/community representatives upon completion of internship. Online Courses •	Online credits are treated as transfer credits. In most cases, the number of online courses that will count toward graduation will be limited to two credits. •	Students must receive approval prior to enrolling in online courses. When students apply to post-secondary institutions, it is their responsibility to make sure that they provide the institution with official transcripts for non-Fryeburg Academy courses. Students should also keep in mind that some post-secondary institutions may not view certain transfer credits as equal to those taken at Fryeburg Academy. Please see your school counselor for an approval form. The Bion R. Cram Library The Bion R. Cram Library has the challenge of meeting the needs of the students from widely varied backgrounds. The mission of the library collection is to provide students with access to a variety of media consistent with curricular needs, enrichment materials which are related to the curriculum, and recreational materials. While the library does not attempt to satisfy all the needs of the local community, the community may use our existing resources. The library supports the mission of the school by not only teaching the use of the library, but also by providing an atmosphere consisting of respect, learning, and growth. Using the library is presented as a lifelong skill. The library provides personalized service to meet the needs of the students. We have carrels for quiet study, group study rooms, and easy chairs for reading. The library is approximately 8,500 square feet. The school archives collection is also housed here. We display items in the cases in the library lobby. In the outer lobby of the building is the Goldberg Gallery, which displays artwork by professional artists. This may be viewed by the community during library hours. SPECIAL SERVICES The faculty of the Special Services Department has a humanistic outlook and considers the needs of the whole child. Instruction begins at a level where the student can succeed, and each student is accepted as a unique individual with different learning styles. To enable students to develop self-esteem through successful learning experiences, each student’s strengths are recognized and instruction is built on those qualities. The faculty accents the positive. Realizing that adolescents with learning problems are apt to suffer from frustration after experiencing repeated academic difficulties, rapport and trust between teacher and student are an integral part of the program. We believe that all students benefit from the experience gained in school and from working with others of diverse abilities and differences. These interactions help students function more effectively as members of society. The Special Services Department provides specialized instruction and supportive services to students who have been identified as having a disability which requires specialized instruction in order to make progress in the general curriculum. Under the federal Individuals with Disabilities Education Act or IDEA, Maine is required to identify and evaluate students who have disabilities and to offer them individualized education programs (IEP) for special education and related services. Decisions regarding the services that are included in an IEP are made by a team using a process specified in the law. ALTERNATIVE EDUCATION Pequawket Valley Alternative School The Pequawket Valley Alternative School (PVAS) at Fryeburg Academy is designed for 3rd and 4th year students who have been unsuccessful in the traditional school setting and whose strengths may not have been reflected in their past school performance. Our faculty provides an integrated curriculum focusing on the individual learning styles of the students with a strong focus on experiential education. Another core element of the PVAS curriculum is community service. In addition to many local projects, each year students and faculty plan, fundraise, and partake in a large service learning project. These opportunities integrate academic classroom curriculum with meaningful service, in keeping with our philosophy of experiential education while enriching the learning experience and teaching civic responsibility. PVAS enrolls a maximum of sixteen students per semester with two full time teachers and follows the Maine State guidelines for all curriculum requirements. In addition to earning a high school diploma, students are guided through the exploration process of post secondary education planning and career choices. Students who are interested in learning more about this program should talk to their class dean. COURSES AND LEVELS OF STUDY Advanced Placement (AP) and College Level (CL) AP and CL classes are the most challenging courses offered at the Academy. AP courses are offered to those students who have demonstrated extensive knowledge and interest in the subject and desire to challenge themselves with college level course work while in high school. Students who qualify for work at this level have earned at least a B in an honors class in the preceding semester. They also should maintain at least a B to remain in the AP program. Students taking AP courses are required to take the corresponding College Board AP examination in May. Failure to take the exam for reasons other than illness or family emergency will lose AP standing for Semester II. Students who score well on the AP examination receive college credit or advanced standing from most U.S. colleges. The Academy currently offers 20 AP or CL courses. HONORS Material is covered in depth, and the courses move at a highly-accelerated rate. To qualify for honors classes, students must earn a grade of A in a Level 1 class, a B in an honors course, or receive the recommendation of a teacher. Work at the honors level requires high productivity and presents greater challenges than work in Level I classes. Students must maintain at least a C or have instructor permission to remain in an honors course. LEVEL I Level I courses are college preparatory courses, offering students the opportunity to explore their interests while practicing skills in reading, writing, critical thinking, and developing a work ethic. Level I courses are designed to prepare students for admission to a wide range of colleges and universities. LEVEL II Level II courses are designed for students to develop skills in preparation for college, military service, or post-high school employment. Students receive the opportunity to explore their academic interests while acquiring knowledge and developing skills. students are responsible for purchasing their own books. Each successfully-completed course is worth three college credits and 0.5 credits at the Academy. In order for the student to enroll in a course, their School Counselor must approve the enrollment. Students must have demonstrated readiness, capability, and motivation to complete collegelevel work. Parental approval is also required. These courses are available to non-Maine students at the CMCC tuition. See your school counselor if you wish to enroll. In this course students will further explore new mediums and techniques while learning to communicate ideas through visual expression. They will be challenged to solve artistic problems using their imaginations and knowledge of the principles of design. Students will compose artworks that express specific ideas, feelings and emotions, and use critique as a means of interpreting and evaluating their influence on the viewer. The Arts curriculum is a participation-based program built upon the idea that exposure to the arts leads to a desire for further enrichment and creative freedom. Students will: •	Develop capabilities for creating, understanding, performing, analyzing, and appreciating art. •	Enhance communication through art by developing intellectual, emotional, and physical faculties for designing, entertaining, and expression. •	Develop problem-solving skills. •	Develop self-esteem, self-discipline, self-motivation and cooperation. •	Enable life-long learning and achievement through sharing with the community. •	Develop an understanding of human experiences, past and present, and the interdependence of work in the arts and worlds of ideas and events. In this course, students will learn the basic principles of design including drawing, composition, and color. Emphasis will be placed on creating artwork that communicates an understanding of fundamental principles of art using a variety of media, techniques and processes. Students will learn to use these elements to find solutions to specific visual arts problems and begin to use this vocabulary as a means of creating and evaluating works of art. Prerequisite: Art I Preference given to seniors. This course is designed for self disciplined students to develop their own personal styles of expression. Self evaluation and group critique will be used as tools to revise and refine artwork and enhance communication through the arts. Emphasis will be placed on creating a portfolio of artwork that communicates skills and personal strengths in the arts for presentation to colleges. Students in this course are expected to be focused and independently motivated. This course is designed for the student who wants to learn more about theatrical performance both through observation and through creative expression. During the semester students will attend professional performances and write evaluations to develop critical awareness of the varied components of stage performance as well as develop a deeper appreciation for the relationship between performance and the diversity of culture. In the classroom students are expected to enhance self-expression through scenes, character study and improvisation. Experience is not necessary- just a willingness to participate. Because the material is as varied as individual choice and skill, students can elect to take this course multiple times and receive credit. In this one-semester class students will learn to design and run lighting and sound for a variety of theater and performance events at the academy. Students will learn about using computers to design sound and lighting needs for a performance and about the instruments to make that come to life. In this course students will demonstrate an understanding of the principles of design while being introduced to a variety of new mediums and processes including sculpture and the pottery wheel. Students will begin to develop an awareness of periods and concepts that shape the arts with emphasis on the contributions of the 20th century. Students will demonstrate personal aesthetic and begin to understand criteria for critiquing artwork. performances at select school events. Students in band are eligible to audition for Fryeburg Academy’s instrumental jazz ensembles. Honors credit may be earned by qualifying for auditioned honors ensembles at the district and state level. No prior musical experience is required. CHORUS	0750/0751 All students are welcome in this vocal music offering. The course focuses on rehearsal and performance of choral music from the Renaissance through contemporary periods. Numerous, required performance experiences are provided during the school year, beginning in the fall with a cappella at the Fryeburg Fair, participation in the jazz residency, and traditional choral music at the Annual Candlelight Concerts. The second semester can begin with spiritual music for a community celebration off campus, and conclude with the spring concert. Honors credit can be earned through acceptance and participation in auditioned ensembles at the district and state level. No prior musical experience is required. Instrumental Music is a course designed to build skills on a wind or percussion instrument, and increase a student’s knowledge of the repertoire of their chosen instrument. Students will work in groups and one-on-one with Fryeburg Academy’s music faculty to develop a practice routine, and prepare music for solo or group performance. This course is designed to develop keyboard proficiency in the novice pianist and a knowledge of music theory for any musician. Students will progress from learning about pitches and rhythms, to intervals and scales, and finally to chords and simple harmonization. Keyboard technique will be acquired through playing scales, chords, and melodies in traditional and popular songs of the student’s choice, and becoming a functional musician through reading and writing musical notation and chord symbols will be stressed. Each student will perform a “recital” at the end of the semester, which will include a melody composed and harmonized by the student, as well as a song of the student’s choice. No prior musical experience is required. This course may be repeated with the permission of the instructor. This course will examine basic music fundamentals with focus on music reading, writing, and analysis. Concepts covered will include note reading, minor/major key signatures, scales, time signatures, form, harmony, chord analysis with Roman numerals, composition (limited to the ideas covered in the course), instrument ranges, and a look at various musical styles. Exams will cover concepts mentioned above and may include take-home composition projects. No prior musical experience is required. This course is an introduction to playing guitar or bass. Students learn to play a variety of musical styles including rock, blues, jazz, and folk. In addition to learning to play guitar or bass, students will work together in four to five member rock bands. This allows the opportunity to try drums and keyboard as well. A student may repeat this course (to advance) with the permission of the instructor. MUSIC TECHNOLOGY I	0755 Semester I Music Technology I introduces students to the world of audio engineering. The class looks at music production in both studio and live settings, with a special focus on recording, mixing, and editing. Students will learn about different microphone applications, critical listening, production management, and effective troubleshooting. In this class you will have the opportunity to work on professionally recorded projects as well as projects we record in class. Prerequisite: Music Technology I Semester II Music Technology II is available to those who want to take their audio engineering skills to the next level. In addition to taking a deeper look at the subjects covered in Music Technology I, you will have the chance to help run sound for live shows at Fryeburg Academy’s state-of-the-art Performing Arts Center. JAZZ THEORY AND IMPROVISATION	0752	Prerequisite: At least two semesters in the Fryeburg Academy chorus or band. This course, for intermediate and advanced vocalists and instrumentalists, teaches jazz chord progressions through the study of a limited number of standard jazz tunes. Students will learn to improvise using the chords and scales related to each tune. The class focuses on daily performance and ear training. Written assignments include solo transcriptions, solo compositions, and the creation of standard jazz lead sheets. Prerequisite: (One or more of the following and the instructor’s permission) Introduction to Music Theory, Guitar Theory, Piano Theory, two semesters of band or chorus. This full-year course is designed to expand aural, theoretical, and technical skills in music. Music composition, melodic practices, theory of harmony, sight singing, dictation and other musical concepts are studied, encompassing the Common Practice Period (1600-1900). Students in this course must take the AP examination given in May. This course provides an introduction to digital photography. The shooting focus of this course is on photographic composition techniques. The photoshop focus is color corrections to enhance the image and how to use basic editing tools and make basic composition images. Students have a shooting assignment each week to improve their skills. Prerequisite: Photo I This course focuses on taking students’ photographic talents to a more advanced level. They will learn how to use manual camera settings to achieve desired results. The shooting focus is thinking more creatively and pushing outside of the box. Photoshop skills will also be brought to the next level by focusing on quality of the final image. This course will give students an overview of the many aspects of digital film production. Students will be introduced to a wide range of skills including writing, story boarding, directing, lighting, cinematography and editing. Students have the opportunity to use digital cameras and iMovie editing software to create finished film projects. Prerequisite: Digital Filmmaking 1 or prior experience/ interview with instructor. This is a practical, hands-on course for students who want to continue with more advanced filmmaking skills leading to the creation of their own short films. Professional cameras, lighting and Final Cut editing software will be utilized to give students access to some of the same tools used by professionals in the motion picture industry. Students are urged to submit their finished films to be shown during the Fine Arts Festival at the Leura Hill Eastman Performing Arts Center. PHOTOSHOP	CL	1445 Semester I Seniors Only. Registration fees apply. This course is an introduction to Adobe Photoshop incorporating the basic principles of layout and design, presented in a project-based format. Students will utilize selection tools, layers, retouching tools, colorization techniques, and filters in the correction and manipulation of photographs. Three credits through Central Maine Community College. Students should see their school counselors to pick up CMCC’s course registration form in the Spring. how to edit, display and save photographs for printing and the web. The student must have access to a 12MP or higher digital camera with the capacity to control shutter speed, aperture and ISO. Students must pick up, complete and return to their school counselor CMCC’s course registration form before Thanksgiving break. INDEPENDENT STUDY	(in Art, Film, Photo, Music, or Music Technology) Prerequisites: At least one semester in the subject area and the instructor’s permission. Students wishing to pursue an independent study in the arts must arrange a meeting with the instructor and develop a project proposal BEFORE the beginning of the semester. Once the requirements have been established and agreed upon, then the course can officially be added to the student’s schedule. *Independent Studies do not factor into a student’s GPA or class rank; they are, however, listed with the grade on a student’s transcript. ENGLISH The English curriculum at Fryeburg Academy provides a systematic accumulation of skills that promotes each student’s ability to construct meaning through reading, listening, and viewing. It also teaches how to present ideas and information through writing, speaking, and visual media. These skills developed through English language arts are essential for communicating the many dimensions of human experience, for working in other academic disciplines, and for engaging in the benefits and obligations of our culture and democracy. With a primary focus on reading and writing, the English curriculum fosters understanding and appreciation of the English language in all its capacities. Our goals are to enable students to make the experience and enjoyment of English a central part of their lives, as they construct and synthesize meaning from multiple sources, and to facilitate life-long learning. English I - IV are taken sequentially at each grade level. Students may not take two of these courses concurrently other than for the purpose of credit recovery following a course failure. descriptive, expository, narrative and persuasive essays. Students learn to research using a variety of sources and references and complete a substantial research project in the spring semester. Grammar is a large part of the curriculum, with a focus on the basic structure of sentences and how to identify parts of speech in a sentence. This course is offered to freshmen who need to improve their fundamental English skills. The reading program includes contemporary writers, classics, and adolescent literature. The writing program includes instruction and guidance in the steps necessary for writing a research paper, expository writing, and personal essays, with an emphasis on the fundamentals of grammar. Students work to improve their organizational and study skills. Programs are adjusted to meet the abilities and needs of individual students. Work at the honors level requires high productivity and presents greater challenges than work in Level I English classes. Students who sign up for this level should read at grade level or higher. At this level, the emphasis is on reading classic literature. Class discussion and effective communication skills are emphasized. Expectations also include a higher sophistication both in writing and in critical analysis of literature. Students are required to complete the designated summer reading as it segues into the first literary unit in September. Students should also expect to be tested on the assigned summer reading. This year-long course is intended for sophomores who have every intention of applying to college. As such, the reading program features a diverse collection of writers, cultures, and genres, with an emphasis on increasing the students’ understanding of figures of speech, imagery, inference, symbolism, satire, and irony. Through writing multiple short essays, students become proficient in analyzing and interpreting textual evidence from primary and secondary sources. Longer essays hone the development and support of thesis statements. Research skills are refined and practiced in at least one research paper that requires multiple sources. Creative writing may include, but is not limited to, journal reflections, poetry, short stories, and one-act plays. At least one Shakespeare play is required. Vocabulary and grammar skills are studied as essential to reading, writing, and oral communication. Each student is required to deliver an original speech by the end of the year. various texts. Writing skills are addressed through multiple short essays to introduce the development and support of thesis statements, longer five-paragraph essays, creative writing, poetry, journal reflections and research. Vocabulary and grammar skills are studied as essential to reading, writing, speaking, and professional communication. Each student is required to deliver an original speech by the end of the year. Skills addressed include strategies for analytical and interpretive reading, understanding the cultural backgrounds of the literature, and the nature and implications of the language used in the texts. Students will learn to glean appropriate information about the interpretations of the texts from analytical articles. Also, a major focus of the class will revolve around the process of writing and rhetorical applications, including research related support of thesis statements. Standard English conventions will be addressed on a case-by-case basis. Class discussion and various presentations will focus on the process and delivery of speaking to an audience. English III focuses on American literature, although at least one Shakespeare play is required reading. Relationships between literature and culture are studied by considering the original context of writings, informed by the students’ knowledge of American history. Topics of discussion will include the American dream and how it has changed over time. What has it meant to be an American in the past, and what does it mean now? Vocabulary exercises designed for SAT preparation are included in the curriculum. Speaking skills are integral to classroom work every day and are crucial to formal presentations and public speaking events. This is a rigorous, writing-intensive class requiring students to complete many essays and a research project by the end of the year. This course is designed for the student who requires more time and focus in reading comprehension and writing skills. It will include the study of major American writers, a research paper and extensive review of English conventions. The program addresses the process of writing using analytical reasoning. Assessment is based mainly on four to six thesis-based essays written during the semester, reading comprehension quizzes, creative projects and skills development. critical essays using those approaches to the literature. This class should be seen as preparation for AP Literature and Composition and will therefore develop the skills necessary for that course or for college English. Prerequisites: Recommendation from sophomore English teacher, successful completion of testing essay, and completion of summer reading. This course is intended for those students who already exhibit a strong command of standard English grammar and the five-paragraph essay. The aim of this course is to teach students to write effectively in their college courses across the curriculum and in their professional and personal lives. Students will be engaged in becoming skilled readers of prose written in a variety of periods, disciplines and rhetorical contexts, and in becoming skilled writers who compose for a variety of purposes. Emphasis is on expository, analytical and argumentative writing that emerges from reading across the curriculum, rather than solely from personal experiences and observations. Students in this course learn to read primary and secondary source material carefully, to synthesize material from these texts in their own compositions, and to cite source material using conventions recommended by Modern Language Association (MLA). Ultimately, the goal of this course is to increase an awareness of writing and reading as interactions among a writer’s purpose, audience expectations, and subjects as well as the way generic conventions and the resources of language contribute to effectiveness in writing. Students will be required to take the AP exam in May. This survey course offers a focus in reading and writing intended to prepare students for college-level work. Units may include (though are not limited to) British Literature, Gothic Literature, Graphic Novel and Literature of the Insane. Through close reading of a wide variety of literature, students will hone their analytical and critical thinking skills. In addition, students will learn to write clearly and effectively. Emphasis will be on the writing process through drafting, revising, editing and peer review. This survey course offers a focus in reading and writing skills. Units may include (though are not limited to) Fantasy, Dystopia, Graphic Novel and self-selected fiction. Through a combination of independent and guided reading, students will hone their analytical and critical thinking skills. In addition, students will learn to write clearly and effectively. Emphasis will be on the writing process through drafting, revising, editing and peer review. Prerequisites: An A in English III L1, a B (or higher) in English III Honors, or recommendation by English III instructor. English IV Honors is a challenging adventure into the global and personal landscape of the written word through memoir, fiction, rhetorical analysis, journal writing, formal writing, and ending the year with a personal portfolio. The first semester is devoted to studying the language, author’s tone, purpose, as well as the themes of Holocaust memoirs and dystopian literature. Students examine the social, political, and cultural times in which the author is writing, and students will be expected to engage in intellectual discussion and written analysis of the author’s tone and purpose. The second semester is devoted to students finding their own voices in their writing through the writer’s workshop which includes rhetorical analysis, poetry, fiction, narrative, essay, book project, ending the semester with individual portfolio performances of their work. ENGLISH LITERATURE AP	0140/0141 AND COMPOSITION Prerequisites: Recommendation from junior English teacher, “B” or higher in Honors or AP prior to senior year, successful completion of summer reading requirement. The Advanced Placement course is the equivalent of a first-year college course in literature and composition. Students will read a variety of literature from several different genres and from a wide range of time periods. This course has a heavy reading load and requires a great deal of writing, much of it ondemand (timed). Students will learn to compose sophisticated literary analysis, specifically focused on how literary devices work together to illuminate the meaning of a work as a whole. Students in this course are required to take the AP examination in AP Literature and Composition (given in May) which determines whether a student may be eligible to receive college credit for the course. The twelfth-grade program offers students a choice of semester-long electives. Only those courses with sufficient enrollment will actually be offered. Short Fiction class will introduce students to readings of short fiction which represent a variety of authors, time periods and nationalities. The class will concentrate on reading to understand the elements within the short story; looking at patterns and components of structure, style and theme. Students will analyze literary elements such as plot, point of view, characterization, setting theme, tone, style and voice and cultural context. Students will keep a comprehensive literary response journal which will consist of literally their own “response” to an element, component,or strategy in each of the short stories they read. SPEAKERS OF OTHER LANGUAGES (ESOL) + CENTER FOR INTERNATIONAL STUDENTS (CIS) The ESOL Department promotes learning that enables students to achieve greater independence in their academic endeavors, become lifelong learners, and be responsible, involved individuals. Our goals are for students to use English to communicate and achieve academically, and to use English in social and culturally appropriate ways. In addition to English courses, the department also offers core courses for students who are in the process of building their language skills. The department also serves to advise international students and provide support in the process of acculturation. ESOL ENGLISH COURSES ESOL English classes focus on the development of academic language skills and proficiency. Students are grouped together by communicative ability and skill level. All ESOL English classes integrate reading, writing, speaking, listening and grammar directed at preparing students to succeed in FA mainstream courses as well as post-secondary studies. MATHEMATICS The Mathematics Department at Fryeburg Academy believes that math skills must extend beyond the ability to calculate to the use of mathematics to investigate, analyze and interpret. A math course should provide practical experience in mathematical skills that is a bridge to the real world as well as explorations which develop an appreciation of the beauty and value of mathematics. The math department expects that students will learn to enjoy, appreciate, and use mathematics as they progress through the curriculum. Students who are challenged to reach these goals will be better prepared for a future in which math will be increasingly important in their lives. Fryeburg Academy students will develop a sense of what numbers mean and how they are used. They will demonstrate computational skills including estimating, evaluating, and reasonableness of answers. Additionally, students will develop spatial and visual skills enabling them to accurately describe and understand the world around them. These skills will enable students to recognize patterns and allow them to make and communicate mathematical decisions based on those patterns. As a part of that decision-making process, students will be provided opportunities to make connections through collaboration and discussion of mathematical concepts. All courses require a scientific calculator. A course in Algebra is required for graduation. This course is for freshmen who need to improve their fundamental math skills before moving on to Algebra 1A. Students will understand and demonstrate computation skills with integers, fractions, decimals, and percents; measurement attributes; investigate and model the underlying mathematical principles behind their work; and develop their skills in algebra concepts such as variables, expressions, and one-step equations. Algebra 1A is the first part of a two-year Algebra 1 sequence that focuses on mathematical problem solving using linear expressions, equations and inequalities. Students will understand and apply operations with integers, percentages, rational numbers and proportions. An emphasis will be placed on the algebraic manipulation of linear expressions; solving one-step, two-step and multistep equations. Students will be introduced to operations with integer exponents, rational exponents and radicals. Problem solving skills play a major role in this course and students will learn how to use mathematical processes to solve a variety of problems. Prerequisite: Algebra 1A Algebra 1B is the second part of a two-year Algebra 1 sequence designed to expand on the fundamentals of Algebra. Concepts from Algebra 1A will be reinforced and expanded upon. Students will understand and apply operations with integer exponents, rational exponents and radicals. The course includes in-depth coverage of writing, solving and graphing linear equations and inequalities with an emphasis on analyzing functions and their graphs. Students will be introduced to statistical functions including mean, median, mode, range and probability. Students will also be introduced to quadratic equations, exponential growth/decay and solving systems of equations, polynomials and factoring. The Algebra I course is designed to provide students with an extensive study of linear functions and their graphs, inequalities, exponent operations including rational exponents, and the use of these concepts to solve various problems including problems involving ratios, proportions and direct variations. Basic algebraic concepts, such as variables, order of operations, and problem solving skills will be reinforced. Students will receive a thorough introduction to functions and function notation. Additionally, students will learn how to solve linear equations, including multi-step equations, equations with multiple variables and equations involving decimals, as well as write a linear equation based on the graph of a line. Students will also be introduced to basic statistics, solving systems of equations, polynomial expressions and quadratic functions. Scientific calculator required. Prerequisite: Algebra I The Algebra 1 Honors course covers the standard Algebra I material in greater depth with some additional topics involving higher levels of abstraction. Scientific Calculator required. with an emphasis on solving quadratic equations, interpreting quadratic graphs, and understanding exponential growth and decay as well as simple and compound interest. Data representation, basic statistics, and probability will also be covered. Prerequisite: Algebra I Topics covered include the geometry of two and three dimensions. Use of algebraic principles, probability, discrete math and other topics is integrated throughout the year. The relationship of shapes and their parts are studied through measurement and reinforced through proof and construction. Proof also emphasizes the skills of mathematical decisionmaking. Discussion and use of real world models enhances learning throughout the year. Students are expected to have a protractor and compass for every class. Scientific calculator required. Prerequisite: Grade of A in a high school Algebra I course, A/B in a high school Algebra Honors course or special recommendation. Standard Geometry material is covered in greater depth with some additional topics involving higher levels of investigation and abstraction. Scientific calculator required. Prerequisite: Geometry Level 1 The Algebra II course is designed to apply the fundamental skills of algebra to such topics as functions, equations and inequalities, probability and statistics, exponential relationships, quadratic and polynomial equations, and matrices. Students will understand and apply operations with complex numbers, exponents and radicals. Additionally, students will use their algebraic skills to solve systems of equations and inequalities and interpret the solutions. This course introduces students to the composition of functions and inverse functions as well as inverse variation. Scientific calculator required. Prerequisite: High School Geometry Honors The Honors Algebra II course covers the standard Algebra II material in greater depth with some additional topics involving higher levels of abstraction. Successful completion of Algebra II Honors will prepare students to take Pre-Calculus Honors. Scientific calculator required. logarithmic functions; multiple systems of equations; probability and statistical analysis; and other topics introduced at the discretion of the teacher. SAT review is woven into the course at appropriate times of the year. College credit is possible provided students earn a successful CLEP score at the end of course. Scientific calculator required. Prerequisite: Geometry Honors and Algebra II Honors with a grade of A or B AND the May Term Algebra II Honors course with a grade of A or B. This course is available to students with a strong interest and proven ability in math and science. Students will explore quadratic, exponential, logarithmic, periodic, rational and polynomial functions graphically, numerically, analytically and verbally. Functions will be investigated as models of change and most of the examples and problems are given in the context of real-world problems. This course stresses a conceptual understanding of mathematical ideas and is designed to prepare students to learn calculus and other college level mathematics. Students are required to complete a summer assignment prior to the start of the school year. Texas Instruments (TI-83/84) calculator required. Prerequisite: Pre-Calculus Honors with a grade of A or B AND the May Term Pre-Calculus course with a grade of A or B. The course covers the theory and application of the derivative and its interpretation as an instantaneous rate of change using numerical, graphical and analytical approaches. The theory of the definite integral and anti-derivatives is developed with strong focus on applications in geometry, physics and economics. The course follows the College Board curriculum in order to adequately prepare students to take the AP examination, which is required for the completion of the course. Texas Instruments (TI-83/84) calculator required. Prerequisite: AB Calculus This course begins with advanced integral techniques and covers applications of the integral, sequences, series, Taylor series and vectors. In the second semester students begin multi-variable calculus. Students will be required to take the AP Calculus BC examination. Texas Instruments (TI-83/84) calculator required. mathematical reasoning and communication. Probability and statistical concepts including measures of central tendency, standard deviation, combinations/permutations, probability, sampling and various distributions will be covered. Scientific calculator required. AP STATISTICS	0240/0241 Prerequisite: Successful completion of Pre-Calculus or grade of A/B in Algebra II Honors The purpose of AP Statistics is to introduce students to the major concepts and tools for collecting, analyzing, and drawing conclusions from data. Emphasis will be placed on mathematical reasoning and communication. Probability and statistical concepts along with calculation will be covered. Students will be required to take the AP examination. Texas Instruments (TI-83/84) calculator required. This class examines the topics of gross pay, banking, investments, credit, marketing, and accounting systems. It promotes financial literacy and uses a wide variety of technological tools, as well as Glencoe’s Personal Finance textbook. Learners become well versed in Excel, Powerpoint, online financial calculators, research methods, and business records. Students obtain real life experience by working with local businesses in designing promotional ads to increase sales. They also converse with international experts in the field through Skype. Functions, the mathematical modeling process, exponential growth and decay, decimals, percentages, debits, and credits are used consistently throughout the year and strengthen students’ numeracy skills. Those wishing to take the class should have a strong work ethic, prepare to communicate their findings verbally and visually, and desire to learn business practices alongside personal decisionmaking skills. Scientific calculator required. STATISTICS I	0254 Prerequisite: Algebra I Statistics I is a one-semester elective primarily intended for Juniors and Seniors. Students will understand and apply measures of central tendency, analyze data using a stem and leaf graph and frequency distribution, standard deviation, normal distribution and associated measures, sampling techniques, data and/or study analysis, and ethical considerations. It is an excellent course for the student who wants to increase his/ her ability to apply math, to learn mathematical topics in depth and to learn material not covered in other math courses. Students who plan to participate on the math team will find this course very beneficial. SCIENCE Experience through exposure and training in diverse fields of science is imperative for the overall education of young people in a technologically challenging world. The science department offers programs and curricula for students of various abilities and interests. Scientific literacy is essential for our students to stay abreast of an increasingly competitive world marketplace. Since science is a process used to solve problems, the science curriculum offers and encourages students to develop competency with the scientific method in both theoretical and practical ways. Laboratory science is an integral part of the science curriculum because it allows students to manipulate data variables in a controlled environment and mandates the use of the scientific method in analyzing the results. Mastery of scientific vocabulary and concepts is equally important, for it permits the student to articulate those results. The science faculty firmly believes that the talents of all students will be developed and their potential realized through the pursuit of the department’s goals. Additionally, the tremendous benefits that technology offers can only be realized if students accept the challenge of the science offerings. These benefits can be achieved in a framework of environmental and aesthetic respect, as well as in a learning atmosphere that is personal and fun. If our graduates are to survive, compete and flourish in a scientifically oriented global society, they must be prepared and experienced in every aspect of science. The science department feels strongly that its programs can accomplish that goal and is dedicated to helping students find success in pursuing it. Descriptive Biology is a laboratory-oriented course that introduces students to the diversity among and connections between all living things past and present. Topics of study include adaptation, evolution, biodiversity, classification, identification, biochemistry, cell structure, photosynthesis, cellular processes, and genetics. Students practice and develop laboratory skills through research, experimental design, use of technology, writing of lab reports, and application of the scientific method. Students in Descriptive Biology are expected to be able to memorize short lists of material, take classroom notes, read and understand a textbook, participate thoughtfully in classroom discussions, and take quizzes and tests. In laboratory work, students are expected to follow instructions and work safely without constant supervision. Students will apply inquiry and problem-solving approaches in class activities and laboratory work. They will learn to formulate and justify ideas to make informed decisions about scientific situations and issues. They will practice skills in communicating scientific ideas through use of appropriate symbols and terminology in a variety of forms. Students will understand the historical, social, economic, environmental, and ethical implications of science and technology in the 21st century. Biology Honors is a laboratory-oriented course that introduces students to the diversity among and connections between all living things past and present. Topics of study include: adaptation, evolution, biodiversity, classification, identification, biochemistry, cell structure, photosynthesis, cellular processes, and genetics. Students practice and develop laboratory skills through research, experimental design, use of technology, writing of lab reports, and application of the scientific method. Students in Biology Honors are expected to be able to memorize extensive material, take detailed notes, read and understand a textbook, participate thoughtfully in classroom discussions, and write well-organized essays. In laboratory work, students are expected to follow detailed instructions and work independently. Students will apply inquiry and problemsolving approaches in class activities and laboratory work. They will learn to formulate and justify ideas to make informed decisions about scientific situations and issues. They will practice skills in communicating scientific ideas through use of appropriate symbols and terminology in a variety of forms. Students will understand the historical, social, economic, environmental, and ethical implications of science and technology in the 21st century. Basic calculator required. Students experience a rigorous academic year of discussion and labs involving detailed studies of several biological disciplines including molecular biology, cellular biology, genetics, evolution, botany, biotechnology techniques, animal physiology and ecology. Students apply inquiry and problem-solving approaches in daily class activities and practice communicating scientific concepts and terminology in a variety of forms. This includes the writing of inclusive lab reports based on AP lab requirements. In addition students will get a taste of the social, historical, economic, environmental and ethical implications of science and technology in the 21st century. Students are required to take the AP exam in May. Scientific calculator required. OLRC FIELD BIOLOGY HONORS 1354/1355	LEVEL 1 1350/1351 This course for highly-motivated ninth and tenth grade students is a hands-on opportunity to learn Biology while developing a greater understanding and appreciation of our local environment of Fryeburg, Maine and the Mount Washington Valley. We will study biological processes and ecological relationships in the natural world, with a significant emphasis on fieldwork, research, and outdoor expeditions. The Saco River Valley intervale, White Mountains, and other northern New England geographies are regular classroom and laboratory spaces as students pose and test scientific questions in the field, as well as regularly engage in hiking and orienteering activities. Completion of the course addresses one semesterâ&#x20AC;&#x2122;s worth of Wellness requirements. This experience-based class will strengthen student skills in critical thinking, collaboration, problem-solving, scientific inquiry, presentation, and outdoor leadership. Students must be comfortable working independently and outside the walls of a traditional classroom. Enrolled students cover a range of academic and learning profiles; honors-level credit in biology are available options. Field Biology will equip high-achieving students who later wish to take Advanced Placement sciences with the skills and knowledge to do so. Basic calculator required. laboratory. Upon successful completion of this class with a “C” or higher, students will receive four college credits at the college that they choose to enroll in. A course fee is associated with this class. Chemistry is a college preparatory course in which students are given an introduction to the structure of matter and the changes it undergoes through chemical reactions. Problem solving methods are emphasized throughout the course through laboratory work, data analysis, and applications to real-life problems. Topics of study include unit analysis, measurements, atomic and molecular structure, periodicity, nomenclature, stoichiometry, acid-base chemistry, energy, light properties, gas behavior, as well as applications to biochemistry, energy, and the environment. Scientific calculator required. Applied Chemistry is a level two science course that explores chemistry with an interdisciplinary, project based approach. This course is designed for students that are more interested in concepts than calculations. We will study subatomic structure and the origins of the universe, human physiology and body chemistry, food science, and environmental chemistry. Prerequisite: Honors Algebra I and evidence of a strong foundation in mathematical problem solving. This course covers the same topics as Chemistry but moves at a highly accelerated pace and explores topics in greater depth. Honors chemistry also challenges students to engage in independent inquiry based topics. Texas Instruments TI 36X Pro calculator required. Prerequisite: a B or better in Honors Chemistry and a teacher’s recommendation. Corequisite: Pre-calculus (recommended but not required) Advanced Placement Chemistry is a course that follows the College Board’s curriculum and is the equivalent of a first-year college chemistry course. Topics of study build on principles learned in the general chemistry course with an accentuation on the mathematical formulation and integration of principles. Strong emphasis is placed on problem solving in the area of modern atomic and molecular theories, stoichiometry, gases, kinetic- molecular and collision theories, thermodynamics, kinetics, chemical equilibrium, electro and nuclear chemistry. Laboratory work is also an integral component to the course emphasizing experimental design, data collection and analysis. Students enrolled in this course are required to take the AP Chemistry exam in May. Texas Instruments TI 36X Pro calculator required. OLRC FIELD CHEMISTRY HONORS	1368/1369 This honors-level course for highly-motivated tenth and eleventh grade students is a hands-on opportunity to learn Chemistry in the context of local ecological systems. We will study energy and biological and chemical processes, with a significant emphasis on fieldwork, research, and outdoor expeditions. The Saco River Valley intervale, White Mountains, and other northern New England geographies are regular classroom and laboratory spaces as students pose and test scientific questions in the field, as well as regularly engage in hiking and orienteering activities. Completion of the course addresses one semester’s worth of Wellness requirements. This experience-based class will strengthen student skills in critical thinking, collaboration, problem-solving, scientific inquiry, presentation, and outdoor leadership. Students must be comfortable working independently and outside the walls of a traditional classroom. The course will culminate in a long-term research project and presentation. Field Chemistry will equip high-achieving students who later wish to take Advanced Placement sciences with the skills and knowledge to do so. ANATOMY AND LEVEL 1	0348/0349 PHYSIOLOGY Prerequisites: Successful completion of Level 1 Biology; Open to juniors and seniors . Focus is on an in-depth coverage of the major systems of the human body with special emphasis on the integumentary, skeletal, muscular, cardiovascular, digestive and reproductive systems. The remaining systems are referenced in coordination with the six covered systems. Lab component includes cellular biology, histology, cardiopulmonary measurements and the dissection of the domestic cat. Computer interfaces are also utilized in various lab applications. Students learn to formulate, analyze and justify ideas to make informed decisions about scientific situations and issues. extraction and use. The course emphasizes the study and proper use of fundamental science tools including the scientific method, critical thinking skills, metric system, lab reports, and graphing. Assessments could include homework, writing assignments, labs, field projects, tests, quizzes, and a final assessment. AP ENVIRONMENTAL SCIENCE 1302/1303 Prerequisite: Successful completion of Algebra II, a B in honors/AP Chemistry and Biology. This college level course is a fast paced study of the many aspects of how the planet works, how we affect it, and how it affects us as a result of all of the variables at work. There are 24 chapters and we will try to do at least 20 of them so you should be able to assimilate one chapter each week. Tests generally cover two to three chapters. Lab opportunities will include field work and will mirror chapter topics. Class lectures are designed to supplement the text material. Units include: Foundations of Environmental Science and the Environmental Issues and the Search for Solutions with many sub chapters of information in each unit. You will be expected to do either one Saturday field trip with a two page paper related to the trip or a five-page paper of a design you and the teacher will determine. Students should have math skills at the Algebra II level and a Chemistry and Biology background at the honors or AP level. Students are required to take the AP Exam in May. Prerequisite: Algebra I Basic calculator required. Prerequisite: Geometry; a B or better in Honors Chemistry, or an A in regular Chemistry with a teacher’s recommendation. Corequisite: Pre-calculus Physics strives to describe the universe in the language of mathematics, and this course can be seen as a bridge between the student’s math courses and the real world. Physics at Fryeburg Academy is an algebra-based introduction to many topics in physics, and efforts are made to relate topics studied in class to students’ experience. Students should have a strong foundation in mathematics and should be very comfortable with solving equations, isolating variables, and applying logic to solving problems, as well as basic laboratory and measurement practices. A number of lab experiments, hands-on activities and group challenges are used to reinforce material encountered in problems and allow students to apply their knowledge. Honors physics is recommended for students with excellent math skills who plan to pursue a field of study in physical sciences or engineering. Topics to be covered include mechanics, vectors and scalars, Newton’s Laws of Motion, circular motion, energy and its conservation, linear momentum and its conservation, waves and sound, optics and electromagnetic radiation, and electric circuits. Texas Instrument T1-84 calculator (any model) required. Prerequisites: Pre-calculus; completion of Honors Physics with grade of B or higher, or permission from the instructor. Corequisite: Calculus. This course is an intensive study of mechanics, and prepares students to take the AP Physics C exam in. Students in AP Physics will study many of the same topics as Honors Physics, but in greater depth and more rigorous analysis techniques, including calculus. Emphasis will be placed on applying concepts to problem-solving, developing laboratory techniques, analyzing data, and computational techniques. Labs will be more openended, with students responsible for developing most of the experimental procedure. Students will compile a portfolio of lab reports to demonstrate understanding of experimental processes. Topics include mechanics, including motion in one, two, and three dimensions, graphical analysis, Newton’s Laws, planetary motion, energy, momentum, rotational motion, and simple harmonic motion. Students enrolled in this course will be expected to take the AP Physics C exam in May. Texas Instrument T1-84 calculator (any model) required. Botany students gain knowledge and skills in the art and science of botany. The curriculum primarily involves plant structure and function, soil technology, plant propagation, and landscape design. Other topics included in the course are the classification of plants, ecology, the evolution of plants, plant cells, transpiration, and photosynthesis. In addition, all students must create and complete a final project of their choice that pertains to the study of Botany and the student’s specific interests. This is practical and hands-on course with a number of school and community landscape and design projects. Botany is an alternative science course, which uses the outdoors as a classroom and provides students with an enriching learning experience. Students also take field trips to various nurseries and greenhouses, as well as a day trip to the annual State of Maine Horticulture Show. The spring semester includes the students designing, implementing, and managing the Fryeburg Academy booth at the Home, Garden, and Flower Show at the Fryeburg Fair Grounds. Field Science is a level two science course that is focused on the collection and analysis of data. The course involves many outings around campus and Jockey Cap, as well as trips to Mt. Tom, Crawford Notch and the Saco River. Students will spend time investigating river ecosystems, local climate and meteorology. Students will practice wilderness navigation skills and expand their knowledge of the natural forces that created the Mount Washington Valley. SOCIAL STUDIES The courses offered by the Department of Social Studies are designed to meet the needs of young people who will leave the Academy for further formal education and/or seek a useful place in our changing, democratic society. The department seeks to point out the significant events and ideas of the past and present and their influence on the structure, purpose and direction of modern society. Students are provided with the opportunity to study individual and group behavior, and to apply knowledge gained in social science courses to considerations of past and current social and political problems. To accomplish these broad goals, we believe that our social studies program must focus on providing learning experiences in the following disciplines: history, political science, economics, geography, and behavioral sciences. The thrust of our social studies program is to develop individuals who will understand their own social world, the world of people, their activities and interactions. We endeavor to help students become productive and contributing members of a free society who feel a responsibility to help preserve and expand that societyâ&#x20AC;&#x2122;s values and heritage. Throughout the curriculum, students will be afforded multiple opportunities and modalities to demonstrate their understanding of key concepts, methodologies and interactions encompassed by the social sciences. WESTERN CIVILIZATION HONORS 0414/0415 This course is offered as an intensive study of world history. Students will read, interpret, analyze and critique primary sources to develop skills in historiography and the methodology of historic inquiry to prepare them for future AP courses. They will systematically employ processes of critical historical inquiry to reconstruct and reinterpret the past using a variety of sources, checking their credibility, validating and weighing evidence for claims and searching for causality. Students will investigate, interpret and analyze multiple historical and contemporary viewpoints within and across cultures related to important events, recurring dilemmas and persistent issues. Students will develop an understanding of how social and cultural values can affect oneâ&#x20AC;&#x2122;s world view and be reflected in the historical record. cultures and societies, students will develop their own diverse toolset through which to breakdown and form a multi-dimensional understanding of unfamiliar culture, social movement, or any world event past, present, or future. In this way, the course provides students with the fundamental analytical skills necessary to identify, reason, and interpret the dynamics that shape the modern world. Coursework includes historiographies of international students at Fryeburg Academy, the evaluation of a wide range of primary documents, and world geography. Throughout the year, students will acquire fundamental scholastic skills including organization, outlining and writing, and note taking. This course explores the global history of colonialism from the 15th century to the present, and offers a comparative study of European and non-European colonial policies. Discussion topics will include the ideologies of imperialism; forced and voluntary migration resulting from colonial occupations; modes of resistance to colonial powers; the movement to decolonization; development and globalization; and the legacy of colonization visible today. Students will gain knowledge of modern global interdependence and relations, and experience in cultural studies methods, theories, and concepts, such as the constructed nature of race, gender and nationalism. GLOBAL ISSUES LEVEL 1 0436/0437 LEVEL 2 0442/0443 This course places contemporary global issues in an historical context. Themes include social justice and human rights; international power structures; geo-politics, including the specter of terrorism; economic interdependence; climate change and global health. The course explores the fluid meanings of race, gender, and social hierarchy through cross-cultural comparisons. Students will examine the ways that global markets, social media and human migrations have interconnected and linked peoples that were only recently kept relatively separate by great distances. Students will approach topics in an interdisciplinary manner, drawing from anthropology, sociology, history, economic and cultural studies. Over the course of the year, students will hone their writing, communication, and analytical skills through project based learning and research essays. Prerequisite: a B in Colonialism Honors or an A in Global Issues, Level 1. While covering all of the material included in American Studies II, the honors sections will include more reading and interpretation of primary materials. Students will also be called on to interpret the views of American history throughout the development of the nation. This is a junior class. ONE-SEMESTER COURSES Open to Seniors as well as Juniors who wish to take two Social Studies courses. Preference will be given to Seniors for available seats. SOCIOLOGY	0448 Sociology is designed to explore human behavior in a social context. Students will learn about relationships within groups such as family and peers, and will explore human relationships within society at large. The course will focus on the current social issues and problems facing America today. Specific topics of study include issues of race, gender, equality, poverty and crime. Students will be required to research these and other topics as well as participate in a number of structured debates. Juniors & seniors only. Semester 2; Evening class SOC 101 Introduction to Sociology is an introduction to the study of influences of social and cultural factors on human behavior. Among topics discussed are culture; conformity/ non-conformity; equality/inequality of different races, sexes, and ages; social institutions; group processes; and how change occurs in society. 3 credits through Central Maine Community College. Students must pick up, complete and return to their school counselor CMCC’s course registration form before Thanksgiving break. Free tuition for Maine students. Registration & book fees apply. TECHNICAL ARTS Courses in the Technical Arts Department aim for proficiency in the use of the tools, materials, machines and processes used in industry. Through hands-on experiences in each of the areas, students will develop marketable skills, which will be of significant value when seeking postsecondary education and/or employment. In each of the technical courses, students will have the opportunity to construct quality products using proper construction and design techniques and increasing aesthetic awareness and creativity. Students will understand the term “technology”; will understand how advances in technology have changed the social, economic, and environmental implications of industry; will understand the applied science related to the design of products; and will learn problem solving. The course is designed for the beginner to understand the tools and materials associated with the wood industry. The emphasis will be focused on care and use of hand tools and machinery. Safety practices and good workmanship will be stressed at all stages of the process. All students construct the same product, allowing each to experience the processes used. Units of instruction include science of wood, forest management and conservation, techniques of the past and present, construction and finishing application, and related mathematics. Prerequisite: Beginning Woodworking This course expands upon the skills learned in the beginning level by introducing several new techniques useful to the woodworker. Each student will construct a small piece of furniture by using a set of plans. Interpreting drawings and an increased level of measurement skills are necessary. Units of instruction will be in furniture design, product planning, cost calculation, joinery techniques, finishing, and adhesives. Consumer knowledge and career opportunities are discussed to better the understanding of the industry. Safety is emphasized at all times. Lab fee applies. Prerequisite: Furniture Construction. This advanced course in wood technologies will expand upon the skills, techniques and knowledge gained in previous courses as well as explore new and more difficult strategies and experiences. Areas of wood technology from which to choose may include custom cabinet making, furniture construction, canoe and boat building, clock making, and fiberglass technology/reinforced molding. The course is a very intense, self-motivating, hands-on experience culminating with the creation of a product of superior design, construction and finish. Lab fee applies. This course is based upon product planning and manufacturing. The student will complete a scale drawing using technical drawing techniques and, using those specifications, produce the product on machinery in the lab. Students gain better understanding of the importance of a quality working drawing and the role the metals industry has on their everyday lives. Units taught include types of metals, metal lathe and other machining processes, precision measuring instruments and finishing metal products. Prerequisite: Beginning Metalwork Given the opportunities for employment in the metals industry, this course can be an important link to future work for many students. The course is designed to give the students a thorough understanding of the tools and processes used in the metals industry and enable them to use these tools to construct a product in the lab. Units include precision measurement and tolerances, welding practices including oxyacetylene and MIG, the metal lathe, the milling machine, and reading working drawings. Safety is stressed at all stages, and a good work ethic is emphasized as a skill necessary for employment. Lab fee applies. Safety is stressed in all areas and environmental concerns are addressed as necessary. This course will be offered as a semester course and will be offered both fall and spring semesters. Lab fee applies. Open to grades 10 -12 This course is designed to be equivalent to a first-semester introductory college computing course. In this course, students will develop computational thinking vital for success across all disciplines, such as using computational tools to analyze and study data and working with large data sets to analyze, visualize, and draw conclusions from trends. The course is unique in its focus on fostering student creativity. Students are encouraged to apply creative processes when developing computational artifacts and to think creatively while using computer software and other technology to explore questions that interest them. They will also develop effective communication and collaboration skills, working individually and collaboratively to solve problems, and discussing and writing about the importance of these problems and the impacts to their community, society, and the world. Algebra skills or high motivation helpful. Students are required to take the AP exam in May. TECHNOLOGY Fryeburg Academyâ&#x20AC;&#x2122;s technology department provides handson, project-oriented study with immediate 21st-century relevance and potential. Courses include introductory experiences in computer and internet applications as well as more advanced computer science pursuits, including study options in coding, software design, networking, and IT user support. Technology instruction at FA aims to foster student confidence and build skills and qualities essential in todayâ&#x20AC;&#x2122;s world: technical competence, design-thinking, individual and team project management, independence, and innovation. Semester I This introductory class explores numerous practical creative applications for computers. Students will study innovations in computing while learning website design in HTML/ CSS, 3D design and printing, introductory CAD (computeraided design), and multimedia production. Current topics involving social implications of computer progress are discussed, and students can expect to finish the course with a new level of understanding of computers. The focus is on creative work and graded primarily on effort and creativity. No previous computer skills are required, but self-motivation will be extremely helpful. ADDITIONAL OPPORTUNITIES IN COMPUTER SCIENCE In the interest of keeping students active post-AP, students in independent study work on personal projects, school projects, and occasionally assist in labs for the two AP courses. Eligible students must see the instructor and the Director of Studies for permission. Prerequisite: Athletes only. At least one semester of general fitness or teacher approval. Today, more than ever, teenagers have the right to receive information and learn skills to achieve a high level of health in all of its aspects. Throughout students’ lives, their personal health will be deeply influenced by their attitudes, choices and decisions. With a solid foundation of learning for their physical, mental and social well being, Academy students will be equipped to take responsibility for their health. HEALTH	0522 A requirement for graduation, this course provides information and teaches skills for teenagers to effectively develop their personal, physical, mental, and social health. Discussion is based on empowering students to form positive attitudes toward their health responsibility, the consequences of problems and concerns teenagers face in today’s society. The course covers such areas as mental health, stress management, nutrition, growth and development, human sexuality, prevention and control of disease, alcohol and drug abuse, and physical and emotional abuse. EARLY CHILDHOOD 0450 DEVELOPMENT	This semester course is designed to help the student follow a child’s growth and behavior. It will touch on the understanding of the responsibilities of parenthood along with developing the skills needed to serve as a caregiver to young children. Hopefully, by the end of the semester, each student will be able to reflect on whether children will have a major or minor role in their future. This course will include such areas as prenatal development, physical-motor development, cognitive development, social-emotional development, and caring for children. FITNESS	0514/0515 This course teaches students the basics of physical fitness. Strength and conditioning and cardiovascular workouts are important aspects of this course. Students will learn the importance of lifetime fitness and how to develop a personal fitness routine. Appropriate clothing and sneakers are required. Students participate in a variety of activities which are fitness based. Students will learn the skills which are necessary to become lifelong participants in physical activity. Units of instruction may include field sports, volleyball, tennis, golf, yoga, aerobics, mountain biking, martial arts fitness, low/high ropes courses, badminton, pickleball, volleyball, ultimate frisbee, frisbee golf, floor hockey, walking to a 5k, etc. Students will also be introduced to the fitness center’s strength/cardio machines and equipment. This course may be taken multiple times. This is a fitness course for athletes. Students will learn and execute advanced sport-related lifts and exercises. The focus will be to improve the athlete’s overall strength, agility and fitness levels. Students will be tested in specific areas at the beginning and end of the course. This course may be taken multiple times. Psychology is a semester course for seniors and motivated juniors. Beginning with the psychological function of the brain, students will trace the origins of human behavior and learn how behavior develops from infancy to old age. Other topics studied are emotions, abnormal psychology, genetics, stress and stress management, sleep and sleep disorders, and Sigmund Freud’s theories of development and psycho-sexual development. Each student must keep a notebook and must complete a number of current periodical readings from the field of psychology. INTRODUCTION TO CL	1451	PSYCHOLOGY	Semester I Seniors only. Evening Class	Psy 101 Introduction to Psychology is an introduction to the scientific study of human behavior and its application to everyday life situations. Among the topics discussed are physiological foundations of behavior, altered states of consciousness, emotion, learning, and thinking. Using these topics as a basis for discussion, students will further explore personality, interpersonal communication, conflict, group processes, behavior disorders & therapies, and industrial psychology. Three credits through Central Maine Community College. Students must pick up, complete and return to their school counselor CMCC’s course registration form before the end of the school year. Free tuition for Maine residents. Registration & book fees apply. WELLNESS CREDIT ALTERNATIVES All students must have two wellness credits (including at least .5 credits earned by taking Health) in order to graduate. •	Two seasons of sports earns 0.5 credits. •	Four seasons of sports earns an additional 0.5 credits. •	A year of Field Biology or a year of Field Chemistry earns 0.5 credits •	Health cannot be waived. WORLD LANGUAGES As the world grows more interconnected, we have the responsibility to think and act with a global perspective. Advances in communication, technology, and commerce demand that we understand the languages and cultures of other peoples better than ever before. Our French and Spanish programs offer the opportunity to learn about our American neighbors, Canada and Mexico, along with their European counterparts; to prepare for business and pleasure travel; and to reconsider our role in the global community. In addition to modern languages, Latin is offered for students wishing to expand their study of language and explore the culture of ancient Rome and its influence upon Western civilization. While studying Latin vocabulary and grammar, students build reading and translating skills and develop a better understanding of English grammar and derivatives. Mandarin Chinese is spoken by roughly one fifth of the world’s population. Learning this language will bring students closer to both their native-speaking Chinese schoolmates and Chinese people worldwide. The Latin I course emphasizes basic vocabulary and workings of the language. Reading and writing skills, as well as understanding of English derivatives, are developed as the year proceeds. This course is offered to students at all grade levels. Prerequisite: Successful completion of Latin I and/or departmental testing. Following a brief review, students in the first semester of Latin II continue the study of the workings of the language. In the second semester, students are introduced to brief selections from various Latin authors and the cultural practices, products, and perspectives of Ancient Rome. A balanced development of the four basic language skills – listening, speaking, reading, and writing – is emphasized in these first courses. Fundamental vocabulary and workings of the language are presented in context and reinforced through oral and written presentations. Students read and write short selections to practice their new skills and become familiar with worldwide Franco cultural practices, products, and perspectives. These courses are offered to students at all grade levels. Prerequisite: Successful completion of the first level course and/or departmental testing. Following the format of the first year of study, second level courses continue the development of the four basic skills. Vocabulary growth and increasingly complex grammatical structures are emphasized. Written communication expands from sentence to paragraph formation. Supplementary readings reinforce these learnings and explore the history, geography, and customs of France with a view to crosscultural connections and comparisons. FRENCH III 0932/0933 Prerequisite: Successful completion of French II and/or departmental testing. This course provides an intensive review and expansion of the basic vocabulary and workings of the French language. Particular emphasis is placed on person-toperson communication – both oral and written – in everyday household, school, and travel situations. Students learn about the Francophone regions of the New World and participate in outreach projects to become aware of historical and current cultural connections. They also explore cultural practices in holidays, cuisine, schooling, sports and other pastimes. Prerequisite: Successful completion of French III or its equivalent, plus permission of the instructor. This two-year sequence presents French language, culture, and current issues/events through the reading, listening, and viewing for understanding of authentic short stories, articles, and film. In response, students explain and discuss main ideas, and express and support their viewpoints in oral and written presentations about what they have read and seen. Advanced vocabulary and workings of the language are introduced and studied in context. Students also explore the Franco contribution to the arts, literature, and civilization in conjunction with a survey of French history. This course may be taken for two consecutive years or followed by an AP French course in place of the second year. Prerequisite: Successful completion of one year of Advanced French or its equivalent, plus permission of the instructor. Prerequisite: Successful completion of Spanish III or its equivalent, plus permission of the instructor. Advanced Placement French Language is a college level course which prepares students to take the (required)AP French Language examination in May. Students solidify and refine their knowledge of the French language through intensive, daily practice in person-to-person communication; reading, listening, and viewing for understanding, and oral and written presentation. Cultural practices, connections, and comparisons are discussed as encountered in the short novels, stories, articles, and films which provide the basis for the course. Workings of the language are fine-tuned on an individual basis. This course is reading, writing, and speaking intensive and is only for the highly motivated student. Spanish IV provides the opportunity to polish advanced grammar and writing skills. Vocabulary is expanded thematically through the reading of plays and stories, plus listening and viewing for understanding. These authentic resources also give students the opportunity to gain a deeper understanding of the Hispanic culture in comparison with their own. SPANISH I 0914/0915 A balanced development of the four basic language skills â&#x20AC;&#x201C; listening, speaking, reading, and writing â&#x20AC;&#x201C; is emphasized in these first courses. Fundamental vocabulary and workings of the language are presented in context and reinforced through oral and written presentations. Students read and write short selections to practice their new skills and become familiar with worldwide Hispanic cultural practices, products, and perspectives. These courses are offered to students at all grade levels. Prerequisite: Successful completion of the first level course and/or departmental testing. Following the format of the first year of study, second level courses continue the development of the four basic skills. Vocabulary growth and increasingly complex grammatical structures are emphasized. Written communication expands from sentence to paragraph formation. Supplementary readings reinforce these learnings and explore the history, geography, and customs of Spain with a view to cross-cultural connections and comparisons. Prerequisite: Successful completion of Spanish I â&#x20AC;&#x201C; II and/or departmental testing. The third year of Spanish strengthens and expands the vocabulary and workings of the language studied in Spanish I and II. This course targets person-to-person communications as a goal for each student. Students explore Hispanic culture through reading and discussion of short stories, plus oral and written presentations which move the Spanish II student towards a more sophisticated level of communication and understanding of cross-cultural connections and comparisons. Prerequisite: Successful completion of Spanish IV or its equivalent, plus permission of the instructor. Advanced Placement Spanish Language is a college level course which prepares students to take the (required) AP Spanish Language examination in May. Students solidify and refine their knowledge of the Spanish language through intensive, daily practice in person-to-person communication, reading, listening, and viewing for understanding, and oral and written presentation. Cultural practices, connections, and comparisons are discussed as encountered in the short novels, stories, articles, and films which provide the basis for the course. Workings of the language are fine-tuned on an individual basis. This course is reading, writing, and speaking intensive and is only for the highly-motivated student. MANDARIN I 0980/0981 In this introductory course, students will begin by learning Chinese phonetics so as to establish good articulatory habits. As the students grasp the fundamentals of pronunciation, they will broaden their knowledge of Mandarin expression through the development of character recognition and writing skills. At the same time, students will learn elements of Chinese culture through various means such as listening to and engaging in dialogue, participating in games, learning songs, poetry and stories, watching videos, visiting websites, learning about traditions, Chinese calligraphy and art, and appreciating Chinese cuisine. Upon completion of this course, students will be able to write key Chinese characters and type them on computer, and use basic vocabulary to engage in simple conversation. grammar and reformulate them to express original thoughts. Mandarin II will expand student knowledge of China and include interaction with Chinese diaspora through cultural excursions and contact with native speakers. MANDARIN III	0984/0985 Prerequisite: Successful completion of Mandarin II or permission of the instructor. This course continues to explore the communicative functions of the previous courses in more depth and breadth. Students will learn to express and comprehend increasingly complex ideas through speech, writing and literature. There will be opportunities to share their knowledge of Mandarin and Chinese culture outside the classroom. Mandarin will be the main language of instruction. Prerequisite: Successful completion of Mandarin III or permission of the instructor. The main objective of the course is to comprehensively equip the students with strong communication skills applicable in daily life. As the student language skills mature, the demands for a wider range of and greater depth of communication topics will naturally emerge. Therefore, the communicative content in this course shifts from topics related to schools and families to those concerned more broadly with society that is, topics that can stimulate meaningful discussion and debate. The students will learn to express their opinions in Mandarin, to participate in discussions on various topics, and to describe and present ideas concisely. Prerequisite: Successful completion of Mandarin IV or permission of the instructor. Mandarin V combines the communicative functions learned from Mandarin I through Mandarin IV. The purpose is to broaden the studentsâ&#x20AC;&#x2122; skills to converse and develop their abilities to express more complex ideas. Topics of interest related to a wide range of fields will be introduced, around which students will be required to engage in discussion and debate. Through comparison, analysis, and discussion, students will have the opportunity to deepen their understanding of Chinese cultures and history. This will include appreciation of Chinese art and music, such as Beijing opera, traditional painting, etc. Students will be brought into authentic Chinese context and have closer contact to the real life of Chinese people. This course will provide a good foundation for those students who plan to continue postsecondary studies in Mandarin and for those who intend to work or study in China. Printed on paper from responsible sources.